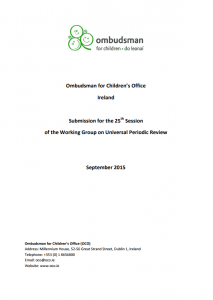 The Ombudsman for Children is mandated to promote the UN Convention on the Rights of the Child (UNCRC) and aims to ensure that Ireland complies with its international human rights obligations. This document outlines views and observations of the OCO ahead of the Universal Periodic Review of the Irish State. This report has been prepared in light of trends in complaints we received; the outcomes of investigations by the Office; the Ombudsman for Children’s engagement with international human rights monitoring mechanisms; our advice to Government on legislative change aimed at advancing children’s rights; our work to consult with and highlight the concerns of children; and research undertaken.